R&D in Canada is conducted primarily in universities as opposed to industry. In fact Canada is an outlier in OECD countries in this respect. Canadian industry on the other hand is below average on R&D spending. This situation has created a significant up hill battle to move investments in university R&D to industry supply chains delaying economic benefits years into the future. Canada’s time to market performance commercializing new technology is far too long. Why is this and what are the implications for Canada? From an industry supply chain perspective products purchased and used by consumers, businesses, or governments are sold by the Original Equipment Manufacturer (OEM) at the “system level” in the top right. Whether they be cars, aircraft, smart phones, refrigerators, the product is an assembly of parts purchased from a supply chain (into the diagram) and constructed in a unique way by the OEM to satisfy customer needs. The assembly of parts are based on building blocks starting with materials, components, subsystems, up to the complete system (seen as series of steps in the diagram). Software may be embedded at the component, subsystem, and/or system level. New technology can be leveraged for competitive advantage in all levels of the product hierarchy in an industry. 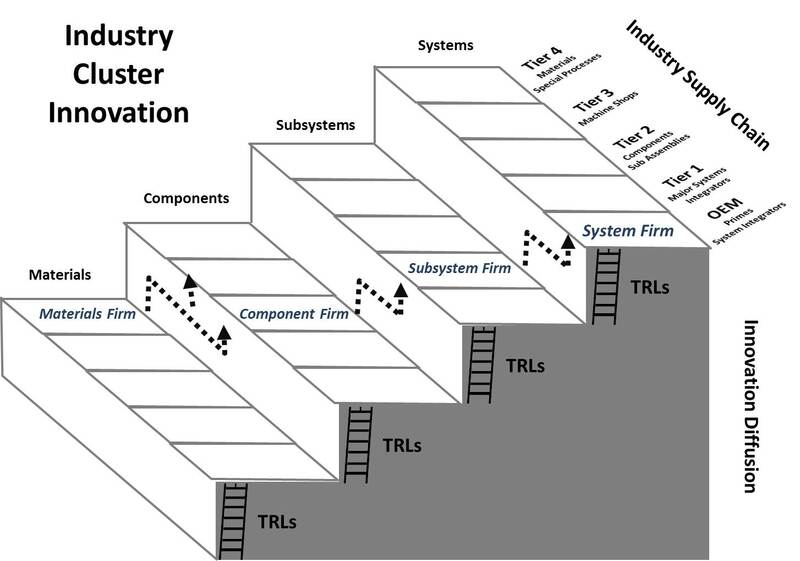 Product industries led by competing OEMs are supported by supply chains typically composed of four tiers below the OEM: Tier 1 major system integrators; Tier 2 components & sub assembly suppliers; Tier 3 machine shop service providers; and Tier 4 materials & special process service providers. Assembly and integration is performed at each level in a value adding process starting with basic materials. Examples of industry supply chains include aerospace, automotive, ships, and consumer electronics. Product development, process/manufacturing development, and continuous improvement is performed at each level in support of business strategy and competitive forces. New technologies compete with existing proven technologies to demonstrate improved performance, quality, reduced cost, and time savings. Each tier therefore presents an adoption period before new technologies are accepted into high volume production and customer use. Customers in this case not only means the end user of the product but also each successive tier as the customer for the next lower tier. Supply chain adoption time is therefore based on development, sales, demonstration, and qualification, and experience from in-service use stages lasting 3-5 years at each tier on average although the adoption time can be much longer in conservative industries and shorter in hyper competitive industries. Supply chains today are global with some national or regional industry clusters where local supply chains have agglomerated at several levels in the past. Canada’s industry supply chains are largely fractured except in certain industries where the country has invested heavily and developed world class “system level” product companies that can exert market pull to the develop local supply chain. Leading examples are Bombardier for commercial aircraft and rail or Blackberry for mobile devices. Unfortunately Canada also has difficulty maintaining a lead as world class “system level” product companies fall from grace such as Nortel or as Blackberry slips. Any part that makes up the end product is based on existing technology with occasional introduction of new technology in hopes of achieving a competitive advantage. Improved product performance, quality, or cost can be achieved through technology advances for any tier in the supply chain. Firms at any level of the supply chain can secure sustained competitive advantage if they take steps to protect their new technology by patents. The technology readiness scale reflects the notion that the earlier stages are big “R” with small “d” with the emphasis moving to small “r” and big “D” in the latter stages. New technology is formulated and validated in the research lab before moving to prototyping in simulated environments and the real world. Uncertainty and risk is reduced at each level until ultimately the technology is proven in the real world. New technology can take 8-10 years to move through the technology readiness scale. Technology complexity and novelty can add time to this time delay. There are few short-cuts although firms that perform more of the steps internally have better control of the commercialization process, with fewer changes of hands, and achieve faster outcomes. Unfortunately the trend in most developed economies is that firms did perform much of the process internally are outsourcing the earlier research steps. University research focuses on lab work which is effective in bringing ideas to proof-of-concept stage. In today’s complex, fast changing world the jump to the real world is very large where lab prototypes are far from ready particularly for demanding operating environments or discerning/fickle consumer markets. A key problem today is that Canadian universities are highly disconnected with industry except in a few rare cases. While geographic separation from Canadian industry clusters or international supply chains is a major source of commercialization delay the leading delay remains due to the commercialization chasm. The implications of long diffusion time from university research commercialization and supply chain adoption are significant for Canada and the leading reasons behind the countries poor return on R&D investment. Should Canada’s economic growth begin to stagnate renewed focus on commercialization performance will take center stage as it is today in Europe and US. As a resource based economy new technology in materials research is an obvious choice to drive growth. Unfortunately material research has the longest path to travel to commercialization because it must progress through both the technology maturity scale and be adopted by industry supply chains in Canadian clusters and global supply chains. The “bottom up” approach to commercialization will not yield timely return in investment to support economic growth. A “top down” approach could be taken but Canada has few “system level” product world leaders to pull from Canada’s university R&D investments and bring alignment to fractured supply chains / clusters. While there is a strong desire for Canadian suppliers to access global supply chains a coherent and integrated industrial strategy amongst the levels of government and plethora of funding programs does not appear to exist. Canada’s small domestic market size and regional politics continue to hinder supply chain efficiency and effectiveness sufficient to align with a dispersed university R&D approach. Canada must get better at developing industrial strategy to maximize return on investments in developing competitive supply chains even if the top supply chain levels are foreign. The National Shipbuilding Procurement Strategy (NSPS) and national energy strategy debate are attempts at forming several new coherent and aligned strategies where none exist today but other industries would benefit such as agriculture, food processing, pharmaceuticals, medical devices, and clean energy. The importance of leveraging national industrial strategy to export trade for a country that depends on exports for its prosperity cannot afford to be lost in the regional political debate. Canada’s university spin-off performance could be better. 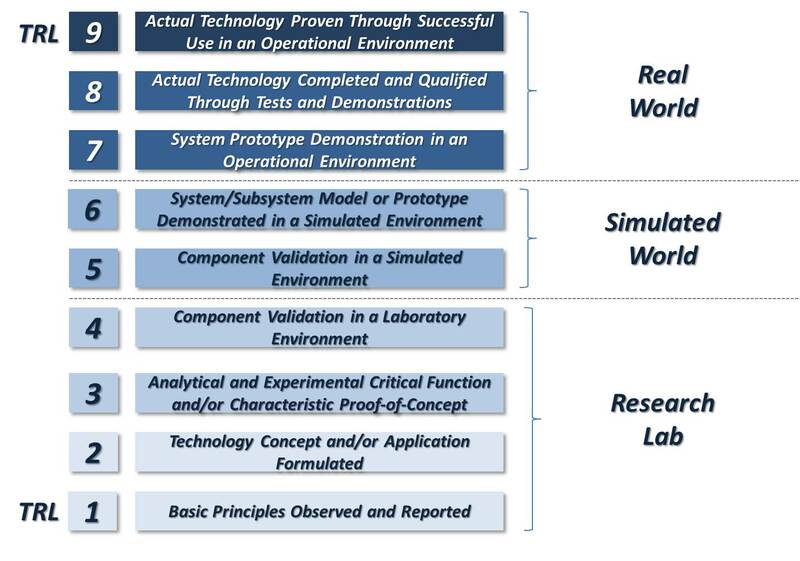 Simulation technology has advanced dramatically in recent years and pilot prototype facilities are increasingly available the cost for these stages are often not included in Canadian R&D funding programs. University spin-offs and start-ups often cannot obtain funding for these stages which is a leading reason underlying the “valley of death” barrier experienced by many Canadian start-ups. 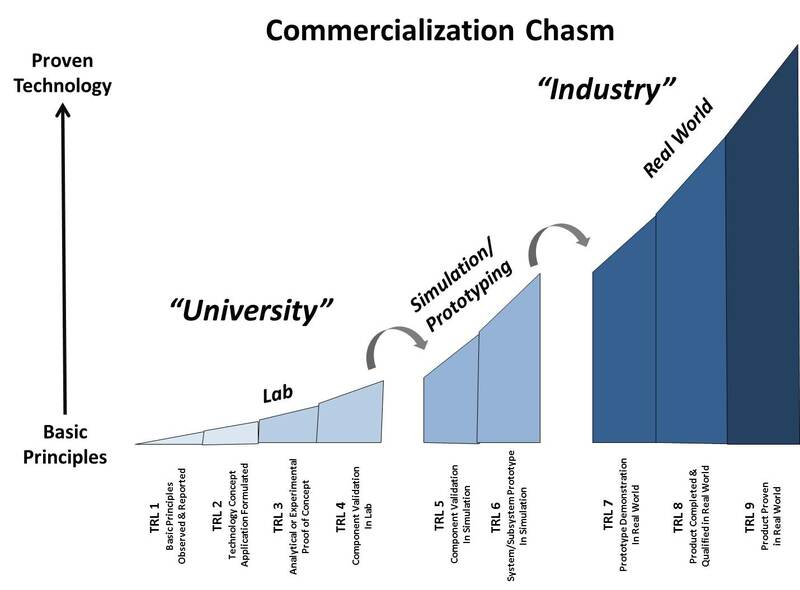 This simulation/prototyping shortfall therefore presents a major barrier or “commercialization chasm” further delaying adoption by industry supply chains. Recent restructuring and repurposing of Canada’s National Research Council is directed at solving this problem but Canada remains weak in developing clear industry strategy to align all the players for better economic outcomes. This entry was posted in Growth, Innovation on September 10, 2013 by Andrew Reif. Hello there, I found your website by means of Google whilst searching for a comparable matter, your website came up, it looks great.